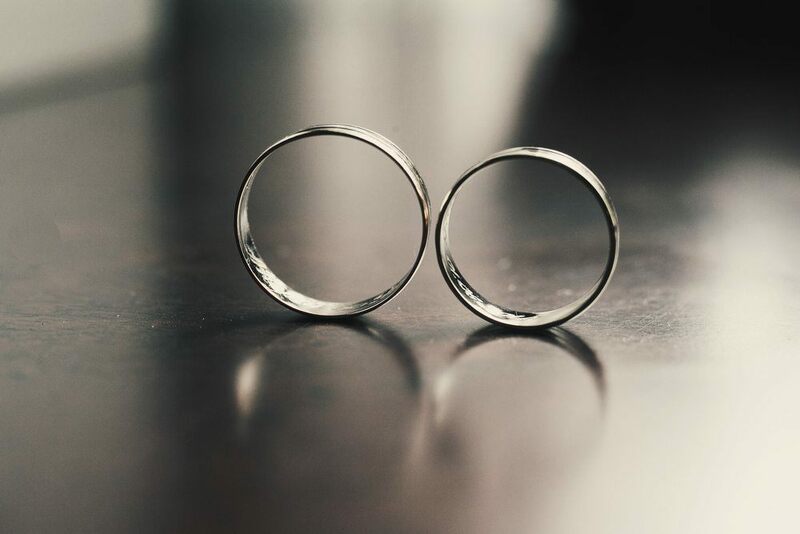 Engraved details are one of the simplest and most meaningful ways to personalize wedding bands. Whether you choose pre-designed engraved settings or add your own details or messages, engraving men’s wedding bands will casually elevate the look of his ring while keeping the cost on budget. Diamonds and gemstones quickly add to the cost of a ring. While engraving does cost a little extra, engraving men’s wedding rings is a much more budget-conscious way to incorporate personalization. Brilliance offers several styles of pre-engraved designs, but, of course, you also have the option to engrave any sentiment or design that you choose. Our stock collections of men’s rings include many appealing engraved designs. One of our favorites is the Fingerprint Engraved Men’s Wedding Ring. 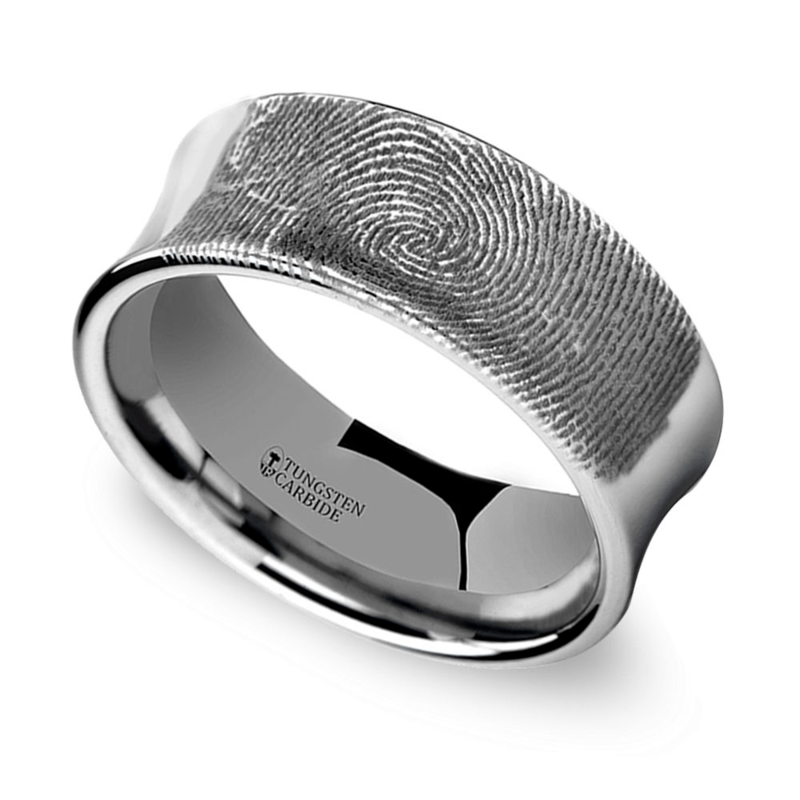 This tungsten band features an engraved imprint of a fingerprint. You can choose a stock fingerprint, or have your own engraved. Yes, this ring can be personalized, so don’t hesitate to leave your mark on his ring! 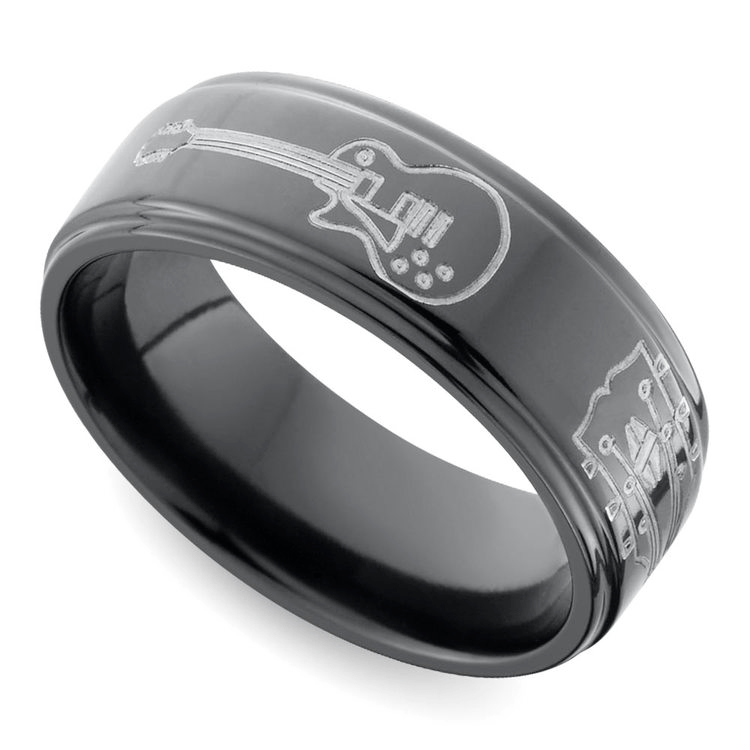 For the musician in your life, present him with a zirconium band that’s laser-engraved with guitars! The pattern plays around the entire Comfort-Fit band. 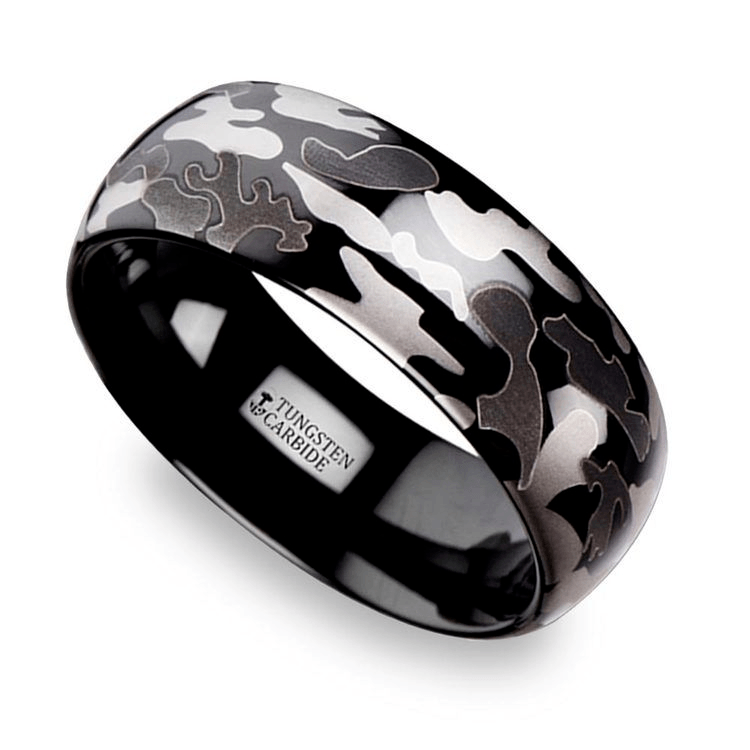 Black tungsten looks great against a detailed camo pattern throughout the ring. This design features a laser-engraved camo design in black and grey. However, not all engraved rings need to include a pattern or images. 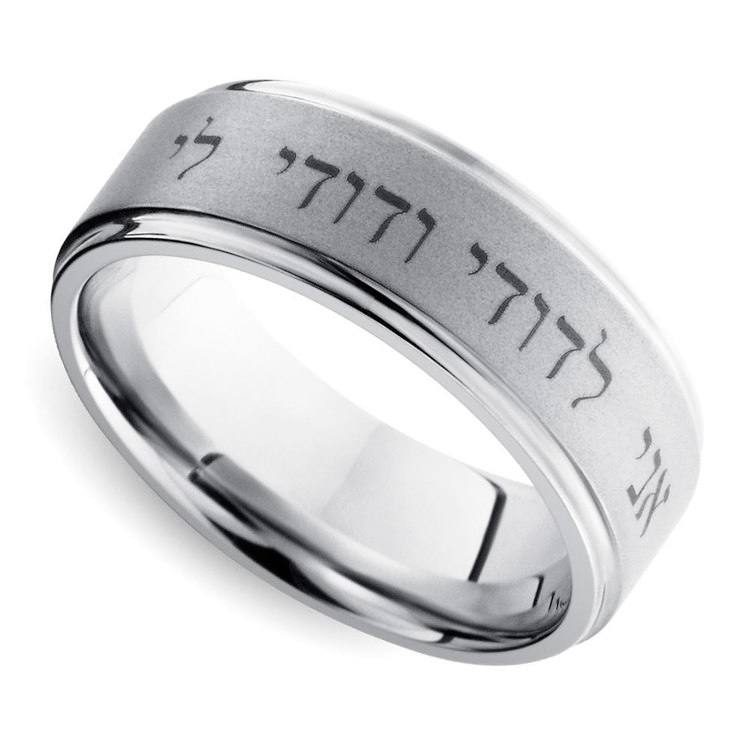 One of our most popular engraved men’s rings features a verse from the Song of Solomon: “I am to my beloved, and my beloved is to me.” The scripture is engraved on the ring in Hebrew. Many Brilliance rings can be engraved with a message or design inspired by you! Choose platinum, white gold or yellow gold for your setting. Brilliance offers nearly every font choice, so you can create a message that looks the way you imagine. A flourishing script font is ideal for romantic sentiments. Script fonts are typically cursive designs and can be simple or more elaborate in style. You can use this font to incorporate a message around the ring or choose a swirling font for an inside the band inscription. Looking to add a monogram? A serif font is a traditional choice for monograms; serif fonts are those that include “feet” details at the end of each letter. The font “Times New Roman” is a serif font. A sans-serif font means that the letters are plain and without embellishments…like Arial font. A sans-serif font has a more casual style, whereas serif styles are a bit more formal. Script—or cursive—fonts may also be used for initials or monograms, and they look extremely elegant. Brilliance can engrave designs into a ring. Weaving Celtic knots, zodiac symbols, constellations; if you want to engrave it, we can design it for you! For custom engraved designs, contact one of our Diamond Experts to get the design process started! There are so many ways to engrave men’s rings: elegant designs, monograms, fun prints, or even short scriptural verses to personalize a ring simply, but sentimentally. Engraving is also an affordable option for adding a custom look to a ring without sacrificing the budget. Choose pre-engraved designs or add your own custom engraved message or design to create a ring inscribed with Brilliance.